Iron ore resources are getting consumed at an accelerated rate because of the growth in the production of iron and steel. Due to this reason the availability of high grade iron ore is reducing and the supply of high grade iron ore to iron and steel plants is declining sharply. Hence, the scenario is steadily shifting towards the use of low grade iron ores and slimes which are stock piled in the mine’s sites for years. These dumped slimes also, in fact, falls in the category of low grade iron ore. Also, some of the ores of iron have a complex mineralogical composition and do not respond to conventional beneficiation techniques. Modern beneficiation processes allow for effective and low cost upgrading of lump, fines and ultra-fines of such ores. Since the iron ores consist of several compositions, mineralogies, shapes, and sizes, so there is no ‘one size fits all’ approach to the beneficiation of iron ore. Most of the ‘run-of-mine’ (ROM) iron ore contain a large percentage of other materials which need to be removed through the process of beneficiation before the ore attains the specifications needed for its use. The extent of the beneficiation techniques employed depends on the level and nature of diluents and the form of distribution of the gangue and impurities in the ore structure. Liberation of ore is an essential step for making it responsive to the beneficiation techniques. For selection of appropriate techniques, it is necessary to carry out first the mineralogical assessment of the ore so as to get the insight into the ore and to know the gangue association, and grain size etc. There are several issues relating to categorization and beneficiation of low grade iron ores. The main difficulty in processing and utilization of low grade iron ores is primarily due to their mineralogical characteristics, the soft nature of some of the ores, and their high silica content or alumina content or both. Other problems which can be associated with the low grade iron ores can be poor liberation and higher content of the hydroxyl bearing minerals such as goethite and limonite with high percentage of loss on ignition (LOI). In case of iron ores associated with the poor liberation, the ore requires fine grinding to obtain adequate degree of liberation of the desired iron mineral and the gangue constituents. The choice of the beneficiation treatment depends on the nature of the gangue present and its association with the ore structure. Several methods/techniques such as jigging, washing, magnetic separation, gravity separation, and flotation etc. are being used to enhance the iron percentage in the Iron ore and to reduce its gangue content. These techniques are used in various combinations for the beneficiation of iron ores. Iron ore is normally beneficiated utilizing the principles applied in separation of the materials by the gravity, floatation, and magnetic methods. Enrichment of ores utilizing the gravity concentration method is one of the oldest and most economic techniques. Although subsequently other techniques like floatation and magnetic separation etc. are also being used for beneficiations of ores but they have only partially replaced the gravity concentration technique and have not made it obsolete. Processes based on the gravity separation technique are extensively being used in iron ore beneficiation because of their low-cost, ease of operation, and eco-friendly nature. The gravity concentration techniques are based on the differential settling velocities of the different particles constituting the ore. The settling velocity of particles is governed jointly by weight (volume and density), buoyancy, and drag forces. The most commonly used gravity techniques for beneficiation of iron ores are shaking tables, jigs, and spirals. 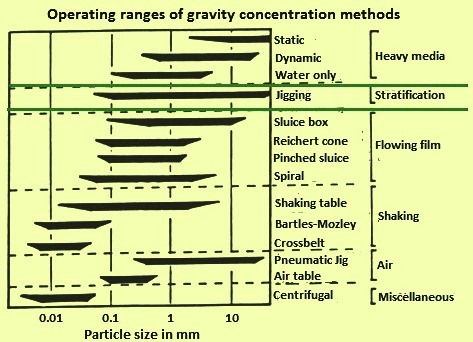 The typical operating ranges of the gravity concentration methods are given in Fig 1. In some places reduction roasting of the low grade hematite ore is done to convert it into magnetic ore before the application of the magnetic separation method for the ore beneficiation. Another method which can be employed is the use of a dense medium in a gas-solid fluidized bed for the enrichment of iron ore. The selected dense medium and the gas pressure for fluidization depend on the characteristics of the iron ore needing enrichment. Any effective beneficiation treatment needs as a first step effective crushing, grinding, and screening of the ore. This is an essential step for the liberation of the iron enriched particles. For this suitable crushing, grinding, and screening technologies are to be employed. The purpose of grinding and regrinding is to reduce the ore to a size small enough to liberate and recover the valuable minerals. The crushing, grinding and screening system for the beneficiation of the iron ore is to be designed taking into account the requirements of the downstream beneficiation processes. The crushing units may include primary, secondary, tertiary and quaternary crushing units. Jaw, gyratory, cone, and roll crushers are used for ore crushing. Semi autogenous grinding and autogenous grinding circuits are generally used for grinding of the ore. Both rod mills and ball mills are used for this purpose. Capital investment and operation costs of grinding equipment are high. Hence economics play a major role in planning for the degree of crushing and grinding performed to prepare ore for its beneficiation. Other factors considered in determining the degree of crushing and grinding includes the value concentration of the ore, its mineralogy, hardness and moisture content. Closed circuit grinding minimizes over grinding of very friable ores. The more the recirculation load the less is the over grinding of particles. Jigging process is an ore concentration process which is carried out in any fluid whose effectiveness depends on differences in the density of the granular mineral particles. It consists of separation of the particles into layers of different specific gravities followed by the removal of the separated layers. Concentration by jigging process is different from other types of gravity concentration processes such as heavy media separation, where the separation is done directly. Stratification of bed particles in the jigging concentration process is achieved gradually, and the separation into products is realized after a certain time. 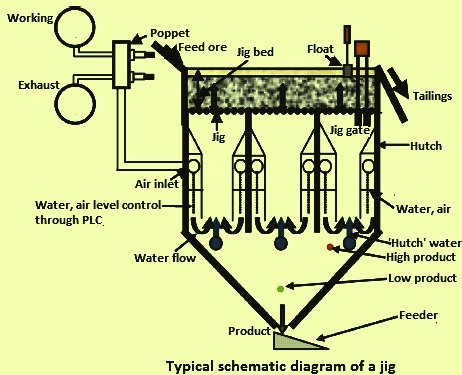 Jigging process is one of the gravity separation method in which the particles are normally of a similar size, often crushed and screened prior to being fed over the jig bed. Though there are many variations in design of the jigs, the basic principles remain the same. The jigging process uses water as the separation medium and can be applied to minerals, ores, slags as well as any other material which has difference in the density between the desired component and the component which is not desired. It is highly effective in the cases where the difference in cut density is more than 4.0 grams per cubic centimeter (g/cc). Jigging is the process of sorting different materials in the ore in a fluid by stratification, based upon the movement of a bed of particles, which are intermittently fluidized by the pulsation of the fluid in a vertical plane. The stratification causes particles to be arranged in layers with increasing density from the top to the bottom. This particle arrangement is developed by several continuously, varying forces acting on the particles, and is more related to particle density than most other gravity concentrating methods. Jigging of iron ores for its beneficiation is being practiced since many decades. The reasons for choosing jigging for the iron ore beneficiation over other processes include (i) relatively easy separation, (ii) beneficial trade-off between operating cost and reduced yield relative to dense medium processes, (iii) ability to treat ores requiring cut densities higher than a density of 4.0, and (iv) physical characteristics of the ore which make heavy medium separation unsuitable (e.g. unacceptable media loss in macroscopic pores). Use of air-pulsed jigs for the beneficiation of iron ores is quite popular. This is since air-pulsed jigs are capable of generating the large pulse amplitudes required to fluidize a deep bed of heavy ore, particularly lump iron ore. In the jigging process, the particles are introduced to the jig bed (usually a screen) where they are thrust upward by a pulsating water column or body, resulting in the particles being suspended within the water. As the pulse dissipates, the water level returns to its lower starting position and the particles once again settle on the jig bed. 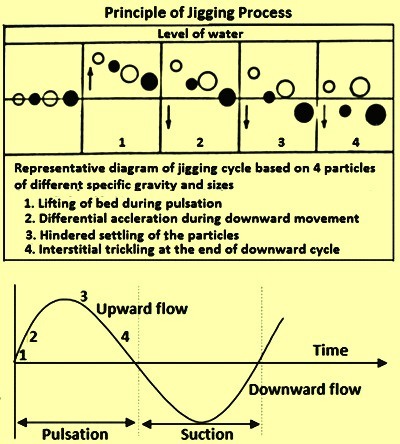 As the particles are exposed to gravitational energy whilst in suspension within the water, those with a higher density settle faster than those with a lower density, resulting in a concentration of material with higher density at the bottom, on the jig bed. The particles are now concentrated according to density and can be extracted from the jig bed separately. In case of the beneficiation of the iron ore, the denser material is the desired enriched ore and the rest is needed to be discarded as floats (or tailings). The principle of the jigging process is shown in Fig 2. Though jigs are simple in operation, the jigging process as a whole is rather complicated and strongly influenced by several interrelating factors (interacting variables or parameters). These factors are directly associated with one or more of the sub-processes into which the jigging process can be divided. The principal sub-processes are the jig itself and the drive unit providing a predesigned stroke pattern, as well as, feeding, feed distribution, evacuation of stratified material, and conveyance mechanism from the jig. Many of the jigging factors are inherently controllable (manipulated variables), but some uncontrollable factors (disturbance variables) associated with the ore to be treated also play an important role in the separation process. These are some of the basic reasons which affect the performance of the jig. The jig bed is normally divided into two zones. The concentrate zone consists of the bottom layers, where the content of heavy ore is to be greater than 95 %. This limit represents a certain concentrate quality. There are two major jig parameters which affect the performance of the Jigs. These parameters are (i) the shape of the pulse, and (ii) the period of time over which ore is pulsed. ‘Pulse shape’ is a broad term used to describe many things. Some of these are (i) amplitude of the pulse, (ii) frequency of the pulse, and (iii) sharpness of the pulse which typically refers to the acceleration of the water column at the beginning of the pulse or its deviation from a sinusoidal shape. ‘Period of time’ refers to the residence time of the ore in the jig bed. With the pulse shape set correctly for optimum stratification rate, it is still necessary to provide enough residence time (depends on the jig width, depth, length) to ensure the difficult material (fine and near gravity materials) has time to migrate to the expected layer in the bed. It has been found that changing the pulse shape affects the rate of separation and the quality of the separation. Usually rate and quality changes are working against each other and a successful jig design uses a pulse shape which gives an acceptable separation in an economically feasible residence time. Hence, a challenge while designing a jig is to select with confidence a jig technology which is properly sized and offers the adequate pulse shape to ensure maximum performance and flexibility. For the beneficiation of the iron ore, use of air-pulsed jigs is more popular. This is because air-pulsed jigs are capable of generating the large pulse amplitudes required to fluidize a deep bed of the heavy ore, particularly the lump iron ore. The fundamental principle of air-pulsed jigging is the injection of low-pressure air (less than 1 atmosphere) into a chamber with an open base, to accelerate the water column through the bed of material being jigged. There are two ways in which this principle is implemented. Either the air pocket runs across the width of the jig below the screen deck, or it is located to one side of the jig bed. The first implementation is known as an ‘under-bed pulsated’ jig and the second as a ‘side pulsated’ jig. The use of air instead of some mechanical system is because in case of mechanical system the instantaneous power is needed to accelerate the water column upto the required velocity which is very high over a short period. A blower supplying air to a receiver operates continuously at a reasonable average power draw. The blower is used for air supply instead of compressor or a hydraulics pack since for a given power requirement, a blower is easier to maintain than a compressor or a hydraulic pack. The air pulsed jig has a construction which consists of a screen deck to support the jig bed and allow the water pulse generated in the air chambers to lift the beds to an acceptable height for the specific material and the hutch water. The hutch water flows through the bed at a constant rate to assist with the separation efficiency and keep the bed fluidized for longer. At the end of the jig, a float measures the stroke of the bed and indicates the product bed height. The height of the product bed is an indication to a programmable logic controller (PLC) to open or close the product gates in small increments to control the product bed height in a narrow band around the set value. The tailings flow over the weir at the end of the jig while the product is collected in the hopper underneath the jig. High and low-level probes start and stop the feeder to control the extraction of the product. The pulse is created by air which enters and exits the air chambers situated underneath the screen deck. The air forces the water in the air chamber down, creating the pulse on the ore bed, and lets the air out to allow the ore bed to settle on the jig’s screen deck before the next pulse begins. The air is generated by a blower and stored in the working air vessel. Poppet valves control the air that enters and exits the air chambers. The air/water interface level in the air chambers is measured by level probes, which control the poppet valve timing to keep the stroke in the air chamber constant. A typical schematic diagram showing a jig with air pulse actuation is shown in Fig 3.